The top six most violent municipalities are near the US border. Ciudad Juárez is in a class by itself with 113 homicides per 100,000 people. José Azueta is the municipality where Zihuatanejo is located. Mazátlan, another popular tourist destination, also appears on the list. Lázaro Cárdenas is the largest seaport in Mexico and ever since the ban on ephedrine, where most of the precursors to produce methamphetamines enter Mexico. Not to mention cocaine from South America. 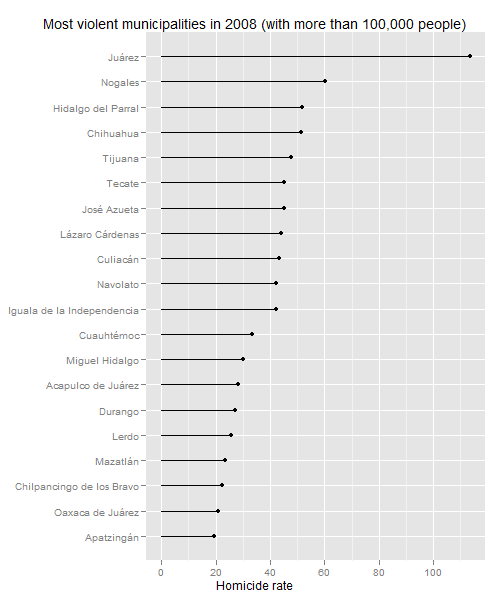 I’m surprised that Miguel Hidalgo appears on the list, since it includes some of the most affluent parts of Mexico City. To leave a comment for the author, please follow the link and comment on their blog: Diego Valle's Blog.